Stunning. Stimulating. Surprising. Funny. Mesmerizing. Moving. Disney/Pixar film, Coco transcends the typical animated film. Directed by Lee Unkrich (Finding Nemo; Monster's Inc.) and Adrian Molina (The Good Dinosaur; Ratatouille), Coco is the latest magic from Disney/Pixar to hit the screen. Coco doesn't just meet then exceed expectations. It excels in every aspect. The story of Coco began five years before it would grace the big screen. In 2012, Unkrich began writing an original story; also by Molina, Jason Katz (Toy Story 3; Monsters University), and Matthew Aldrich (Cleaner; Spinning Man). Molina and Aldrich are credited with the screenplay. Set against the backdrop of the yearly Dia de los Muertos celebrations in Mexico, Coco is a rich world of senses that expands even more upon entering the land of the dead. The vibrant colors radiate from the screen transfixing the audience as they visually weave through the layers of storytelling, and worlds. The opening scene has the main character, Miguel (Anthony Gonzalez; Icebox; Criminal Minds), narrating his family's history as it unfolds from cutout colored flag to flag. Bright colors strung throughout in preparation for the Day of the Dead. 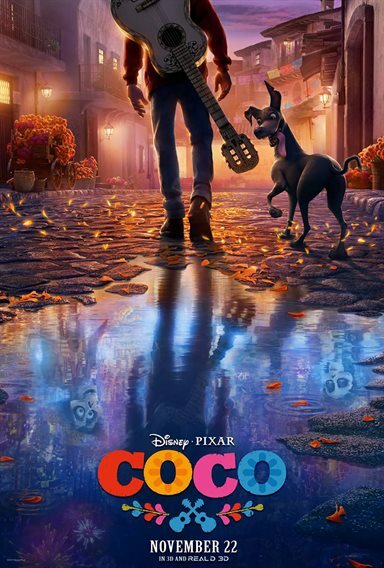 Truly a story about a family, Coco follows Miguel on his quest to fulfill his dreams of becoming a musician (just like his idol, Ernesto de la Cruz (Benjamin Bratt; Doctor Strange; Modern Family), with whom he feels a strong connection...ahem). Miguel plans on entering a talent show at the plaza during Dia de los Muertos. He struggles, however, with the reality that if his family were to find out, they would more than certainly put an end to it. You see, there has been a ban on music in the family since long before Miguel was born. Miguel is driven by his passion for music, and is determined to sing. Unfortunately, the ban on music has existed since his great-grandmother, Mamá Coco (Ana Ofelia Murguía; Mozart in the Jungle), was just a little girl. After his abuelita (Renee Victor; Weeds; Confessions of a Shopaholic) discovers his secret, she destroys Miguel's guitar which sets off a string of events...for he has discovered a secret of his own. Forced to borrow de la Cruz's guitar from his mausoleum in order to perform, he finds himself in the land of the dead with his ancestors at the "Office of Family Reunions." As the story continues to unfold, and Miguel takes us along his journey, the vibrant colors grow more robust. The marigold flower petals meant to guide ancestors to their ofrendas and families form a bridge so beautiful that it appears to breathe with life. The brightly neoned alebrijes that guide the dead actually glow in the dark; among them, the griffin-like Pepita, and...um...Dante? (Dante is a street dog. A Xolo with a tongue to get tangled in who has adopted Miguel.) The entire world that comprises the land of the dead is so alive with colorful lights, fireworks, and creatures. Travelling through the land of the dead has sprinklings of familiarity; gleaning nuances from Star Wars, Avatar, and Las Vegas without borrowing. The splendor of Coco's richness encompasses far more than just the vibrancy of color. The music is exhilarating, inspiring, and soothing; from the melodic vocal sounds to the strumming of the guitar. Whether beautifully on-key, or intentionally going out of capable range, there is delight in the listening to the voices of Anthony Garcia (as Miguel), Gael García Bernal (as Héctor), and Bratt (as Ernesto de la Cruz). Hearing Alanna Ubach (Girlfriends' Guide to Divorce; American Horror Story) sing as Mamá Imelda is a particular gem. The scrutiny of every last detail is evident; from wrinkles and jowls to cultural distinctions to the very history of Dia de los Muertos. The surrounding world is reflected in the characters eyes; both literally and figuratively. Much credit can be given to producer Darla K. Anderson (Toy Story 3; Cars) who provided all necessary resources (including several trips for the crew) to ensure complete authenticity in every facet of the film be it in the way the Latin tongue is held when speaking, or the sign of the cross by an exasperated abuelita. Not merely a musical and visual pleasure with all the wonder of a Disney/Pixar film, Coco transcends the typical output by adding some unexpected twists within the storyline. Of course, the pure sensory joy itself is something to behold. There are no spoilers (at least, I don't believe so) contained here as it would be a betrayal to the experience of this touching and entertaining film. Download Coco from the iTunes Store in Digial HD. For more information about Coco visit the FlickDirect Movie Database. It was the classic movies shown Saturdays after the morning cartoon lineup that piqued Judith's curiosity for film. That curiosity would give way to a lifetime of exploration and contribution to media productions of all sorts — meandering through the worlds of fashion, public relations, advertising, film and television. Read more reviews and content by Judith Raymer.